EECE Menu Show search box. Welcome to your door to the future! A degree in either Computer or Electrical Engineering will prepare you for many great jobs including ones that haven't yet been invented. Our highly qualified faculty and small class size will provide you with an excellent opportunity to get an education that will prepare you for the rest of your professional life. Programs in our department are known for the hands-on experience that students gain while developing a critical understanding of electrical and computer engineering. Undergraduate students are prepared for professional careers in high demand areas, including computer hardware and software design, embedded and microprocessor systems, electromagnetics, communications system design, control systems, digital signal processing, and analog and digital electronics. Our "Master of Science in Electrical and Computer Engineering (MSECE)" program is unique in the state of California. It was designed to provide a balance between electrical and computer engineering while letting students pick specialization classes in either area. Our graduates have been hired by regional, national and international organizations and we are proud of our prominence as a student focused department that educates students to be future leaders in electrical and computer engineering. Chico is a friendly community of about 88,000 people and includes Bidwell Park, the third largest municipal park in the nation. Chico is situated in a rural landscape approximately 100 miles north of Sacramento, near some of Northern California's finest recreational areas: Mt. Lassen, lakes, the Sacramento River, and streams, offering fishing, swimming, biking, skiing, and hiking. Dr. Kredo wins the 2019 Outstanding New Project Investigator Award. Dr. Kredo is the principal investigator on a project entitled “High Speed, Cost Effective Simulation and Design Techniques for PEPDS”, which is funded by the Office of Naval Research. This project began in December 2018 and will run through December 2022. The goal of the research project is to explore simulation and design techniques for Power Electronic Power Distribution Systems (PEPDS). The results from this project will enable system designers to simulate, design, and implement a system using a single representation of the model or algorithm underdevelopment. His collaborators on this project include Drs. Roy Crosbie, John Zenor, Hadil Mustafa, and Zahrasadat Alavi. Dr. Kredo also serves as the director of the McLeod Institute of Simulation Sciences at CSU Chico. Rawlins Merit Award - Yoana Guzman Hernandez from Chico State College of ECC on Vimeo. Sierra Pacific Foundationmade a donation of $3,000 to the CSU Chico Society of Women Engineers (SWE) in support of Imagineer Day. Imagineer Day is Chico State SWE's annual K-8 STEM outreach event. Over 270 students participated in a series of activities during the day-long event in March 2018. Ms. Kristy Lanham from Sierra Pacific (second from the right) said that Sierra Pacific was pleased to support efforts to increase student interest in STEM in Northern California. 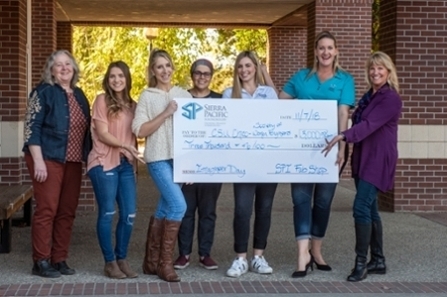 She presented the check to Dean Melody Stapleton (far right); Shelby Freese, CSU Chico SWE president (third from the right); Dr. Hadil Mustafa, SWE faculty advisor (center); and SWE members Monica Fisher and Sydney Holderbein (third and second from the left, respectively). Through the generosity of Sierra Pacific and others benefactors, SWE will be able to continue to host Imagineer Day, exciting the interest of elementary and middle schoolers in science and engineering. Three teams from CSU Chico IEEE Student Branch competed in the IEEE Xtreme 12.0, a problem solving/programming competition that was held October 19-20, 2018. Teams worldwide competed during the same 24-hour time period. Our top scoring team, CSUChico, was ranked 1,185 out of 5,155 teams (top 23 %) with a score of 114.64. The CSUChico team members were Daniel Kirkland, Amritpal Sidhu, and Grace Gonzalez. The Wildcoders, Andres Marquez and Robert Goldansky, ended the competition with a score of 85 and were ranked at 1,332th place (25.8 %). Our third team, ChicoStateRedTeam (Matthew Hardenburgh, Sabas Martinez, and James Johnson) placed 1,553th out of 5,155 (30.1 %). The results are impressive as the competition was more intense this year – the number of teams in the IEEE Xtreme more than doubled. This is our second year participating in the IEEE Xtreme competition and most of our students had not participated last year. Congratulations! 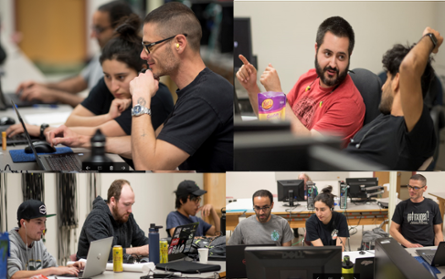 Senior students Andres Marquez (Electrical and Computer Engineering double major) and Dalton Dodge (Mechatronic Engineering major), in addition to EECE faculty member Meghdad Hajimorad are part of the CSU I-Corps program this Fall 2018 semester. I-Corps gives researchers the opportunity to learn "Lean Startup" concepts and biotechnology commercialization by applying evidence-based entrepreneurship concepts through customer discovery. The aim of I-Corps is to create entrepreneurial experiences with all the pressures and demands of the real world. As part of the I-Corps program, the aforementioned CSU Chico team is working to find a problem-solution fit to help stroke patients recover from post-stroke symptoms (speech/communication therapy). As part of the I-Corps program, the aforementioned CSU Chico team is working to find a problem-solution fit to help stroke patients recover from post-stroke symptoms (speech/communication therapy). Dr. Hassan S. Salehi received his Ph.D. degree in Electrical Engineering from the University of Connecticut in 2015, and his Ph.D. was funded by the National Institutes of Health (NIH). Dr. Salehi joined California State University, Chico, as an Assistant Professor in the Department of Electrical and Computer Engineering in August 2018. Previously, he was a faculty member of the Electrical and Computer Engineering Department at the University of Hartford. Mr. David Silveira received his Bachelor of Science degree in Electrical/Electronic Engineering specializing in Power Systems, and his Master of Science degree in Electrical and Computer Engineering both from California State University, Chico in 2014/2018.